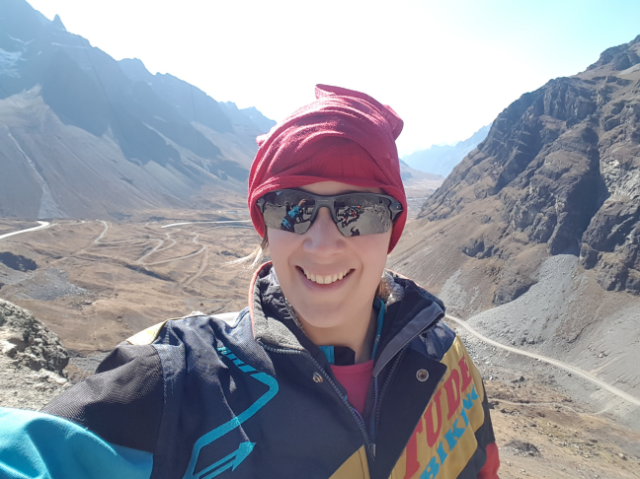 In and around La Paz – on the topic of Death! La Paz has kept me entertained for 10 days or so now. It’s an amazing city, with dark, steep, cobbled streets (which are also pretty un-rideable) and every now and again you capture a glimpse of the majestic mountains surrounding it. The Casa de Ciclistas where I’m still staying is really well located in the centre of La Paz, but still the city can feel pretty sinister at night, especially when I’m on my own. But then a new day begins, the sun comes up and the whole place comes to life, buzzing with people, traffic and markets. 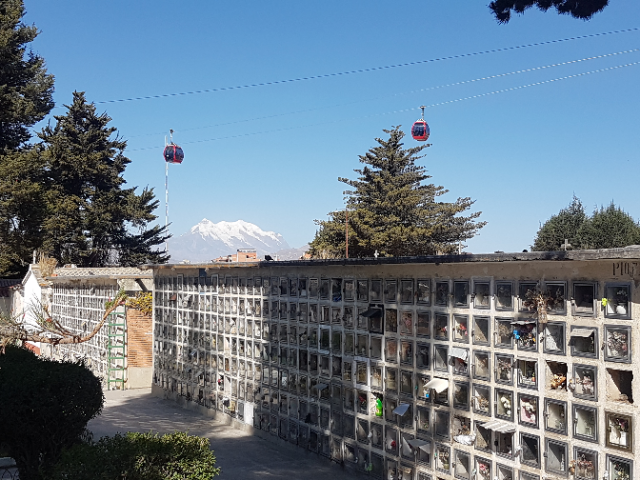 Bolivians are definitely a superstitious bunch, and a visit to the cemetary gave us further examples of this. 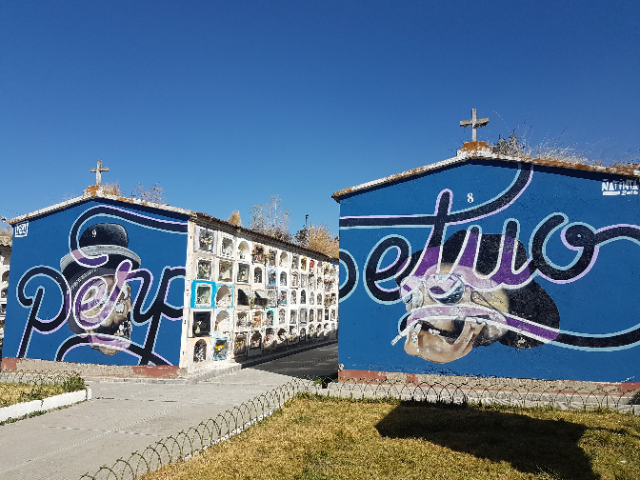 Remembering the dead is a far more celebratory occasion in Bolivia than in most of Europe. Death and corpses are also treated in a very matter-of-fact way. 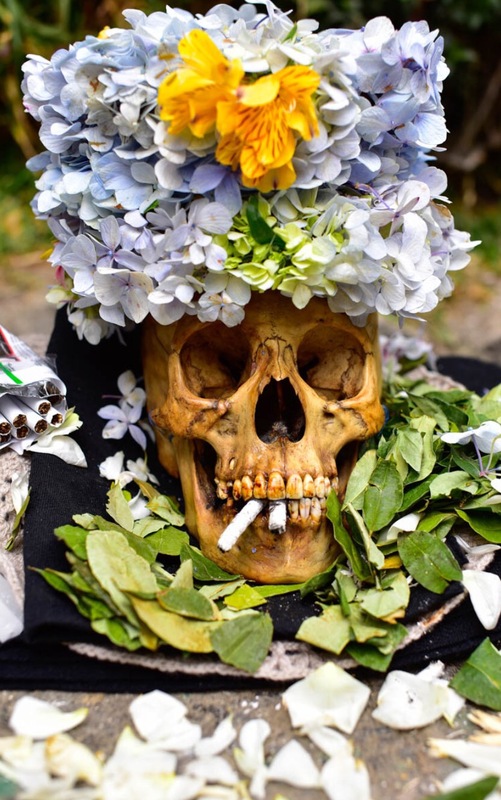 As is the case in Mexico, Bolivians have the ‘Day of the Dead’ (‘All Souls Day’) where families will go to the cemetery to hold a fiesta with their departed loved ones, bringing them prayers, and also cigarettes, a slug of their favourite tipple, music and dancing. It is a day when the deceased are remembered, and partied with like a living member of the family. 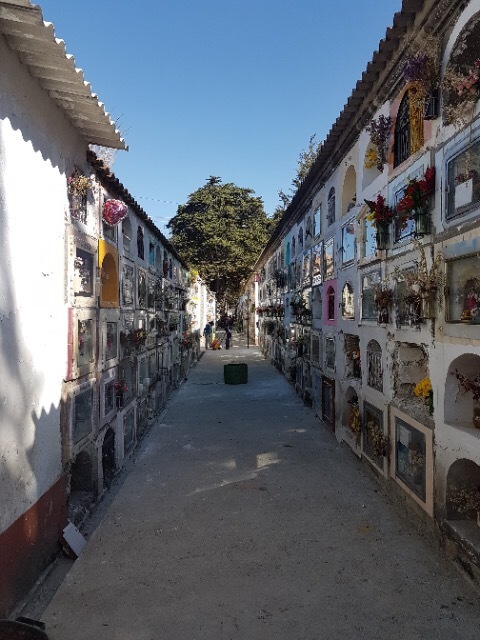 On the more practical side, we learnt that families have to pay an annual rent for a space in the cemetery, and that rent is pretty expensive given space is so scarce in La Paz. If they fail to pay, the body will be unceremoniously extracted from its niche in the wall and replaced with the next cadaver. Who knows what happens with the remaining skeleton – probably better not to know, or perhaps it gets used for something else (read below!). Unlike Mexico, Bolivians also cherish their ‘ñatitas’. These are skulls, typically of deceased ancestors, that Bolivian families have exhumed, kept and passed down the generations through the family. It seems like a very macabre custom, but many Aymaras venerate these skulls. They believe the ‘ajayu’ (soul or spirit) of a person continues to be attached to the skull after death, and that the ñatita will bring them favours and good fortune throughout the year if they care for it well. Aymara also believe that on the eighth day of the eleventh month of the year, the ajayu returns to the world of the living. So on this day – the festival of ñatitas – to thank the ñatitas for their protection throughout the year, the skulls are paraded through the streets decked up in hats and garlands and often wearing sunglasses with a cigarette hanging from their ‘mouth’. This ancient tradition is so strong, that the Catholic Church in Bolivia had no choice but to embrace it in the religious calendar, and it continues to this day. 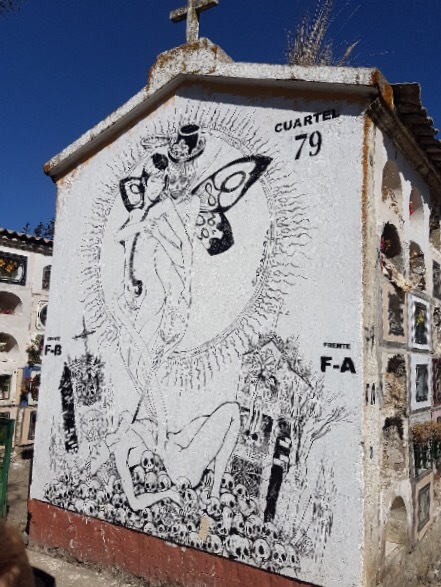 Another surprising aspect to the cemetery – aside from the Teleferico swinging directly overhead – was that it had a touch of the feel of Shoredich, after the council recently ran a competition for graffiti artists to paint their work there. 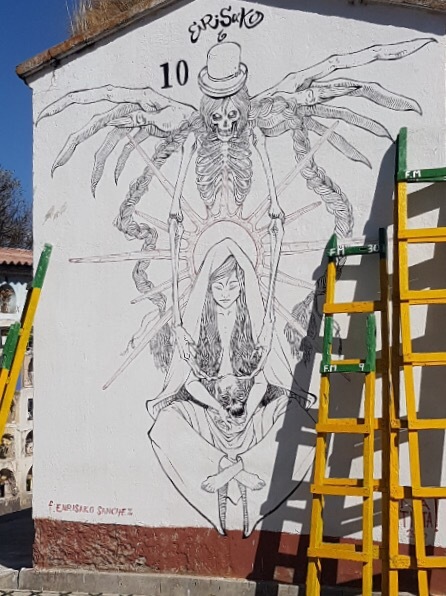 These pieces, whilst initially appearing pretty sexual, often actually depict the relationship between the ajayu, ñatita and the body, whilst others are highly political, criticising the state and low funding of healthcare as a cause for the relatively low life expectancy in Bolivia (69 vs 75 in neighbouring Peru and 82 in the UK). Whilst on the topic of death, the other less morbid (??!) activity I got up to this week was cycling the famous ‘Death Road’. 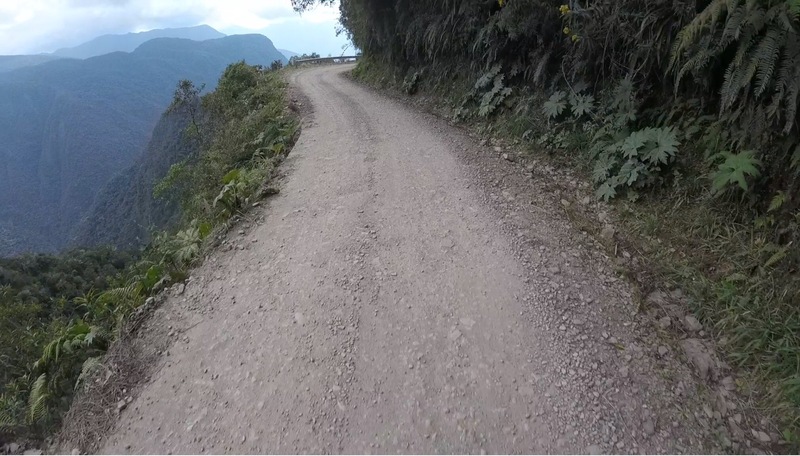 Once named as the world’s most dangerous road, the road winds down from La Paz to Coroico, and often has sheer drops of over half a mile down to the Coroico River below. Until 2006 it was estimated 200-300 people died every year on this road and it’s easy to see why – it was a two-way, dirt track with limited passing places and no barriers, used by cars, buses and lorries. At one point, the rules were changed to drive on the left, allowing drivers to check for their wheels hanging over the edge when passing another vehicle. Happily, a bypass was built a few years ago which now takes the vast majority of traffic, leaving this as a thrilling (and far safer) ride and major tourist attraction for cyclists. 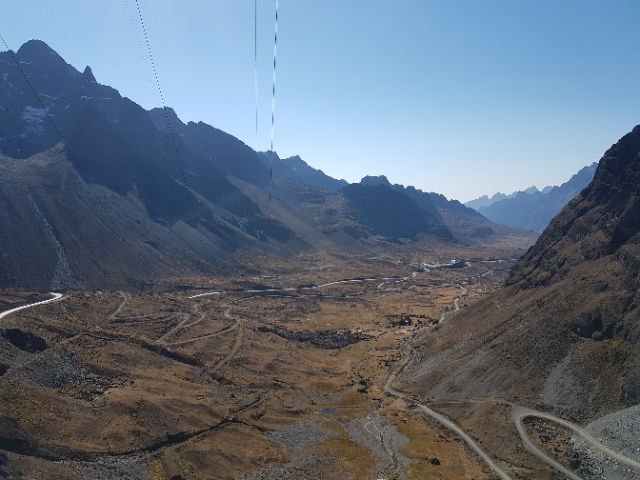 With 64km of near-uninterrupted descent, and stunning views all the way, you head down from the cool, thin fresh air of the altiplano at an altitude of 4,650m to the balmy jungle of the Yungas below at just 1,200m within just a few hours. 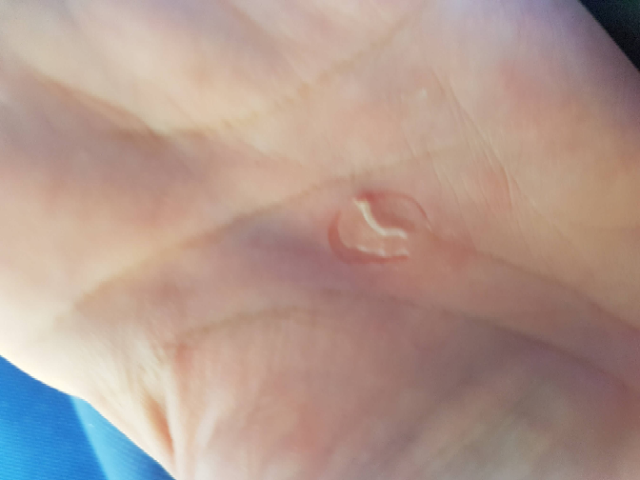 Not fancying rattling my way down on Snarky Puppy (my beloved touring bike), I rented a mountain bike for this trip, and despite the wound (see below!) was very grateful for the extra suspension! Skinning my hands on the way down!